BURO-GDS Inspirations/ Ellen Tongzhou Zhao: Another Pentagram Merde? The Diller Scofidio + Renfro site is finally online. 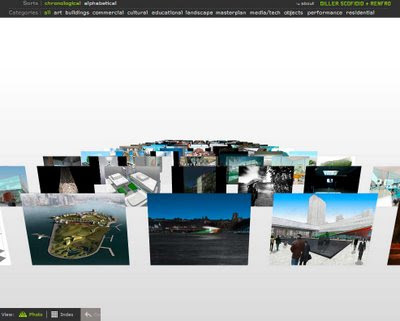 Designed by Pentagram, this site tries to create a 3D browsing experience. However, as soon as you click on a project, the presentation regresses into a traditional flat slideshow format... There's also something really awkward about how the images pop-up and lie down when they are sorted.